All roads have finally led here – the Infinity War. Phase Two of the Marvel Cinematic Universe put strains on our heroes and cracks in relationships started to show. Phase Three will essentially tear the Avengers apart, leave us wondering how our heroes will be able to ever work together again, and introduce us to a few new heroes to boot! By the time you finish this third part of our special “Backtracking” series devoted to the films of Marvel Studios (at least as of April 25th, 2018), you should also be completely caught up and ready to watch the newest film in the series – Avengers: Infinity War! 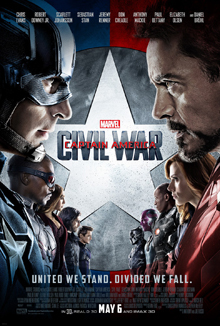 Civil War does something that very few movies are able to do – serves as a sequel to TWO different series. First, it is absolutely the third film in a trilogy for Captain America. This follows directly from the end of The Winter Soldier where Cap is still working closely with Falcon, Agent 13 (who turns out to be Peggy Carter’s niece, and was previously assigned to Rogers by S.H.I.E.L.D. as secret backup), and Black Widow in hopes of being able to find and save Bucky from his Winter Soldier programming. Second, and most importantly, this movie picks right up from the end of Avengers: Age of Ultron which means it is also a sequel to that series as well. With the events that took place in Sokovia during the final act of Age of Ultron, the world isn’t so hot on having the Avengers running around with as much power as they seem to possess. Several countries are asking for the super-powered people in the world to register their real names to be able to appropriately keep tabs on them. Tony Stark is a proponent of the proposal believing they need to be kept in check. Black Widow, War Machine, and Vision agree with him. Meanwhile, Captain America vehemently opposes the idea believing that they will start to be used inappropriately by a council who may have special interests for sending them where they want them to go instead of the team having the autonomy to go where they are most needed. Falcon and Wanda agree with him. As if to make matters worst, Winter Soldier is framed by an angry Sokovian, Helmut Zemo (whose family was killed when Ultron took over the country), in the murder of the king of the African country Wakanda – T’Chaka. T’Chaka was also a major sponsor for the registration effort. His son, T’Challa, takes the mantle of Black Panther and works with Tony and his side to bring Winter Soldier to justice despite Cap’s efforts to save Bucky. Cap eventually contacts Bucky and discovers that the Winter Soldier was responsible for Tony Stark’s parents’ murder. A giant battle takes place between Cap’s forces (he’s also recruited Ant-Man and Hawkeye) and Iron Man’s team (he’s added a young teen named Peter Parker, aka Spider-Man, to his team as well). In the end, Zemo manipulates Cap, Bucky, and Iron Man into place to reveal to Tony that Bucky killed his parents – destroying the relationship between Steve and Tony. T’Challa, realizing that Zemo is the actual villain, delivers him to the authorities, but half the Avengers are imprisoned by Stark… Until Captain America busts them free and they go into hiding. I feel a little piece of personal commentary is necessary for this film in the series. If there is one, and maybe only one, movie you should watch before Infinity War, it is Civil War. It will likely have the most to do with where the main pieces of the Avengers team are (Thor and Hulk aside, that is) for the beginning of the movie than any others. Post-credits scenes: Midway through the credits, we learn Bucky and Cap are being hidden by T’Challa in Wakanda. Bucky is being put into cryogenic sleep until a solution can be found for the Hydra programming that is still haunting him. T’Challa tells Cap that he dares anyone try to come and capture them if the world finds out he is helping them. After the credits, Peter Parker discovers there is much more to the Spider-Man suit provided to him by Tony Stark. Acclaimed neurosurgeon Stephen Strange is living a wonderful life, even if he is a total douchebag. However, that life comes crashing down around him when he suffers massive injuries to his hands after a car accident. In hopes to recover his abilities, he tries experimental surgeries, but nothing works. He meets a paraplegic who regained the use of his legs. The man tells Strange that he learned how to recover through the teachings of the people of Kamar-Taj. Strange meets Karl Mordo, a sorcerer, who takes him to confer with “the Ancient One”. Strange doesn’t immediately buy into the sorcery of the various mystics in Kamar-Taj, but he’s desperate. He does eventually learn more about the Ancient One’s teachings, and his hands improve. Not only that, but Strange’s drive and natural curiosity takes him even deeper and gives him the ability to master the mystical arts quicker than anticipated. A villainous sorcerer, and former disciple of the Ancient One, named Kaecilius attempts to utilize forbidden powers to reach the Dark Dimension and the incredibly powerful demon Dormammu. The discovery of the Ancient One also often dipping into those forbidden magicks causes some of the followers, Mordo in particular, to lose some of their faith. 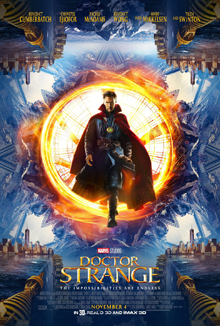 Strange eventually masters a powerful relic called the Eye of Agamotto (which houses the Time Stone – one of the Infinity Stones) to be able to defeat Dormammu and becomes the new Master of the Mystical Arts and a protector of Earth against mystical threats. Post-credits scenes: In the mid-credits scene, Thor is visiting Strange to learn the whereabouts of his father, Odin – this is a scene lifted directly from the upcoming Thor: Ragnarok. After the credits, Mordo attacks and takes the powers from the paraplegic Strange met earlier in the movie and states there are “too many sorcerers” on Earth. Peter Quill, Rocket, Groot, Gamora, and Drax are known throughout the cosmos as the Guardians of the Galaxy after they stopped Ronan from destroying Xandar. They are using their fame to get jobs like the one they are currently doing to protect some powerful super batteries. They were hired by a race of golden people called the Sovereign, and their leader, Ayesha. They do the job in exchange for Nebula, who the Sovereign have captured. However, Quill does not know that Rocket has stolen some batteries for himself causing them to be attacked and chased by the Sovereign. They are saved by a mysterious man named Ego, and his assistant, a woman with empathic powers named Mantis. Ego claims to be Peter’s father. Peter is initially skeptical, but still travels to Ego’s planet with Mantis, Gamora, and Drax. There, he is finally given enough evidence to believe Ego. Elsewhere, Quill’s surrogate father from when he was kidnapped as a child, Yondu, has to deal with a mutiny within the Ravagers after his followers team up with Nebula and capture Groot and Rocket. Eventually, Yondu and Rocket team up and with Groot and escape. Meanwhile, the Sovereign finds Quill, but Quill also finds out that Ego isn’t exactly what he claims to be. He is, indeed, Quill’s father, but he was also responsible for the cancer Meredith Quill, Peter’s mother, died from right before Peter was kidnapped. Ego is called a Celestial – an ancient and very powerful being that is nearly a god. Ego plans on taking over the galaxy after seeding several planets with his own essence. He needs a second Celestial, and that’s where Peter fits in. He is the first out of thousands of Ego’s children to be able to power Ego’s plans. Eventually, the Guardians (with the help of Yondu) destroy Ego and defeat Ayesha and the Sovereign. Yondu sacrifices himself to save Peter because Yondu may not have been his biological father, but he was always Peter’s dad. 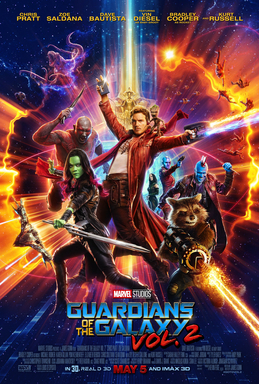 Post-credits scenes: Guardians of the Galaxy has FIVE mid and post-credits scenes (almost used as a joke thanks to the overall light and fun nature of these two films in the Marvel series)! The first is Yondu’s loyal first mate, Kraglin, has inherited Yondu’s whistle-powered arrow and he accidentally sticks Drax with it while practicing. Second, a group of other Ravagers who were friends of Yondu reflect on his sacrifice and proposes to reform their original team (these were the original comic version of the Guardians of the Galaxy, by the way). Third, Ayesha reveals her plan to destroy the Guardians – a perfect being known as “Adam” (Warlock, comic fans). Fourth, Quill chastises a teenage Groot for his messy room while Groot plays video games. Finally, a space traveler (Stan Lee) is telling the story of all he’s seen to two cosmic beings (Watchers) who are walking away and not offering the traveler a ride home. Tony Stark brings Peter Parker home from the shenanigans in Captain America: Civil War. Stark tells Peter that he’ll call him when he’s needed. Peter is desperate to help and eventually become an Avenger, but he’s left basically to just patrol his neighborhood. Peter deals with going to high school, having a crush on a girl who is seemingly out of his league, and being Spider-Man while his doting Aunt May worries for him. Pete eventually does come across an arms deal for majorly powerful rifles made from recovered Chitauri technology. He tries to take on the arms dealers, and their leader, a mysterious man in a vulture costume, only to be woefully under-experienced. 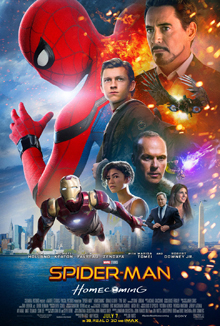 Tony Stark comes along as Iron Man and tries to set him straight about what he should be handling and what he shouldn’t, but when Pete continues to push his luck, Stark takes away his Spider-Man suit. Peter discovers that this Vulture is the father to Liz, Peter’s crush and Homecoming date. Using his homemade costume, Spider-Man fights and defeats the Vulture sending him to jail. Impressed by his abilities without his tech, Stark offers a spot on the Avengers roster for Spider-Man, but Peter turns it down, opting to remain a high school student and local neighborhood hero for now. Post-credits scenes: In jail, Vulture meets Mac Gargan and learns that Gargan has friends who wish to kill Spider-Man. Knowing Spidey is actually Peter Parker, and a friend to his daughter, Vulture (Adrian Toomes), denies the rumor that he knows who the webslinger is. Also, a recurring joke during the movie featuring Captain America rounds out the movie that also breaks the fourth wall in telling the audience they have waited around for nothing. After defeating a fire demon named Surtur (who is prophesied to destroy Asgard in the fabled Ragnarok), Thor discovers Loki is impersonating their father, Odin. They learn that Odin is hiding out in Scandinavia and they go to him just before he dies. Odin warns that when he dies, “she” will return. The “she” is Thor and Loki’s sister, Hela, the goddess of death. She is much more powerful than Thor and Loki combined, and has come to stake her claim of the Asgardian throne. 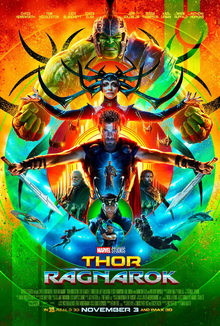 The brothers are tossed out of the Bifrost and land on Sakaar, a planet run by the Grandmaster, while Hela massacres many of Odin’s loyalists on the way to claiming the throne and anointing an Asgardian named Skurge her “Executioner”. On Sakaar, Thor is captured by a slave trader, recognized only as Scrapper 142, who also is a former Valkyrior – one of a legendary force of female warriors who fought Hela long ago. Thor is forced to compete in Grandmaster’s “Contest of Champions” and is set up immediately to battle Grandmaster’s primary champion – the Hulk. Thor nearly defeats the Hulk if not for an implant that inflicts pain and gives Hulk the upper hand. When Hulk reverts back to Banner, he tells Thor he’s been the Hulk for so long that he’s afraid that if he changes again, he’ll never be able to revert back to normal. Thor explains the situation in Asgard and does eventually convince the Valkyrie and Banner to come back with him. They even get the help of Loki who was initially trying to find a way to usurp the Grandmaster’s place on Sakaar. After escaping the gladiator planet, Thor, Hulk, Loki, and Valkyrie battle Hela’s undead forces and use Surtur’s prophecy to destroy Asgard after evacuating everyone leaving Hela to fight (and possibly perish to…?) Surtur. Thor, now King of Asgard, leads what’s left of his people into the stars to make a new home for themselves. Post-credits scenes: Thor and Loki ponder the idea of returning to Earth when a giant spaceship approaches theirs. After being overthrown, the Grandmaster is found in a junkyard by some locals. He proudly declares the revolution to overthrow him a “draw”. T’Challa is being prepared to ascend to King of Wakanda after his father’s death in Captain America: Civil War. However, he faces struggles internally and externally. T’Challa does not quite feel ready to lead his people without his father continuing to teach him the ways of being a successful king. Additionally, T’Challa, being more worldly and wanting to help the outside world more, is unsure of Wakanda’s isolationist ways (the country poses as a third-world country in public to hide their vast riches and scientific advancements). Worse, there is a dark secret in T’Challa’s family. His uncle, who was once undercover in Oakland, California during the late 80s and early 90s, fathered a son, Erik Stevens, who is really, really pissed off about how T’Chaka, and Wakanda as an extension of the King, treated his father. Working with a vibranium (the all important mineral ore in Wakanda that gives them technology the western world has no comprehension of) smuggler, Ulysses Klaue, Stevens enters Wakanda and challenges for the throne – and wins it from T’Challa in ritual combat. Stevens, aka Killmonger (a name he earned as a black-ops soldier), plans to overthrow dozens of governments by shipping out vibranium-powered weapons to Wakandan agents stationed throughout the world. T’Challa (along with his sister Shuri, his bodyguard Okoye, and his love Nakia) battles back to retake the throne. 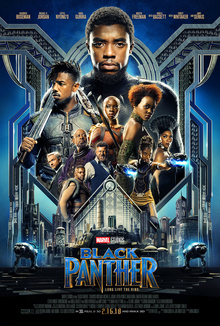 Showing forgiveness/understanding for the second time (the first being with his father’s murderer, Zemo), T’Challa pardons his cousin Stevens and grants him his final wish before dying – to look out at the majesty of Wakanda as his father described it. After retaking the throne, T’Challa and Shuri return to Oakland where their uncle was stationed and decide to build an outreach program for the area youth. Post-credits scenes: At the United Nations, T’Challa speaks to the world with the plans to drop the guise of being a third-world country and offers to share their vast resources to make a positive change for all the people of the Earth. After the credits, we see a camp where Bucky emerges and thanks Shuri for helping to free him from the Hydra conditioning. There it is… A rundown of all 18 Marvel Studios films. You should now be ready for this Friday’s release of Avengers: Infinity War. I will say, it’s clear that the Avengers, Captain America, Guardians of the Galaxy, and the most recent Thor and Black Panther are probably the most key to having a high functioning understanding of what’s happened and where we are leading into Infinity War. I will also admit, though, that I’m a bit biased toward the Captain America and Avengers movies since four of those five films are among my most favorite of the entire run. With that in consideration, there are still some gems in the series that may not be intricately connected to the later films and still very worthy to check out. Enjoy Infinity War this week (or whenever you are able to get tickets for it and check it out). Stay tuned for Film Seizure’s review of the movie coming Friday, April 27, and be sure to check out new episodes of the Film Seizure Podcast each and every Wednesday!